Looking for a fancy dinner to make your loved ones? Want a little cheesy goodness while on your diet? 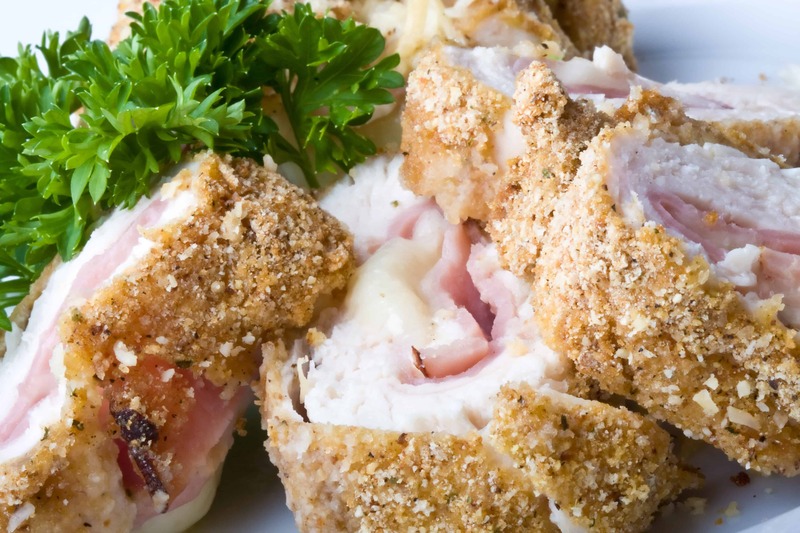 I have a great weekend healthy dinner recipe with Chicken Cordon Blue. This wonderful cheese healthy meal can make a great dinner date meal and your date will not even know it’s healthy. With paying attention to small differences in the details you can make this dish very healthy. I switch out full fat ham, cheese and frying to low fat ham, light Swiss cheese, and using panko to give it the crunch. It may look a little small but I guarantee you you will be pleasantly surprised on how full you are when you are done. You can add green beans or a salad to make it a completely healthy dinner meal. Clean all chicken and slice off any extra fat left on the chicken. Next place chicken into a ziploc bag and use a mallet to pound out the chicken to about ½ inch. ***TIP: Start in the middle of the chicken to pound and move your way out so this does not break the chicken. Next place 1 slice of ham and 1 slice of cheese on top of the ham. Then roll up the chicken up so where the meat covers all of the ham and cheese. Stick toothpicks into the chicken to keep it closed. In a separate dish place the breadcrumbs and Italian seasoning and mix together. Dip the chicken wraps into the egg white and then into the panko mixture. Make sure it covers the whole top of the chicken. *** Tip: Do not make extra using the panko breadcrumbs, they will be soggy the next day.